Home About Universe Alien stars Astronomy Astronomy Picture of The Day Beginners Black holes Gallery Info Infographics Missions Stars Videos The First Signal from Dark Matter? --"Could Usher in a New Era in Astronomy"
Scientists have picked up an atypical photon emission in X-rays coming from space, and say it could be evidence for the existence of a particle of dark matter. The signal comes from a very rare event in the Universe: a photon emitted due to the destruction of a hypothetical particle, possibly a "sterile neutrino". If the discovery is confirmed, it will open up new avenues of research in particle physics. "It could usher in a new era in astronomy," says Oleg Ruchayskiy at Leiden University . "Confirmation of this discovery may lead to construction of new telescopes specially designed for studying the signals from dark matter particles. We will know where to look in order to trace dark structures in space and will be able to reconstruct how the Universe has formed." 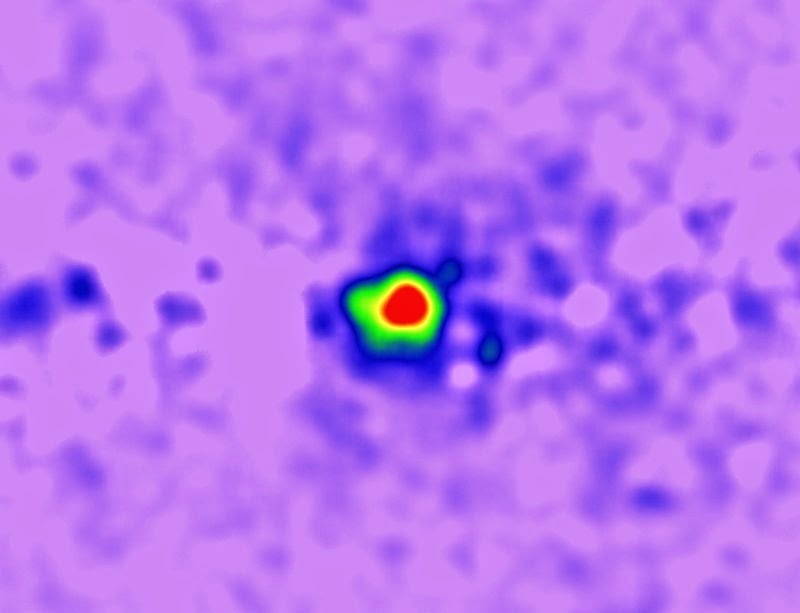 The image is of the center of the galaxy taken by the Fermi space telescope, all known gamma-ray sources have been removed, revealing excess emissions that may arise from dark matter annihilations. Could there finally be tangible evidence for the existence of dark matter in the Universe? After sifting through reams of X-ray data, scientists in EPFL's Laboratory of Particle Physics and Cosmology (LPPC) and Leiden University believe they could have identified the signal of a particle of dark matter. This substance, which up to now has been purely hypothetical, is run by none of the standard models of physics other than through the gravitational force. Their research will be published next week in PhysicalReview Letters. When physicists study the dynamics of galaxies and the movement of stars, they are confronted with a mystery. If they only take visible matter into account, their equations simply don't add up: the elements that can be observed are not sufficient to explain the rotation of objects and the existing gravitational forces. There is something missing. From this they deduced that there must be an invisible kind of matter that does not interact with light, but does, as a whole, interact by means of the gravitational force. Called "dark matter", this substance appears to make up at least 80% of the Universe. Two groups have recently announced that they have detected the much sought after signal. One of them, led by EPFL scientists Oleg Ruchayskiy and Alexey Boyarsky, also a professor at Leiden University in the Netherlands, found it by analyzing X-rays emitted by two celestial objects - the Perseus galaxy cluster and the Andromeda galaxy. After having collected thousands of signals from the ESA's XMM-Newton telescope and eliminated all those coming from known particles and atoms, they detected an anomaly that, even considering the possibility of instrument or measurement error, caught their attention. The signal appears in the X-ray spectrum as a weak, atypical photon emission that could not be attributed to any known form of matter. Above all, "the signal's distribution within the galaxy corresponds exactly to what we were expecting with dark matter, that is, concentrated and intense in the center of objects and weaker and diffuse on the edges," explains Ruchayskiy. "With the goal of verifying our findings, we then looked at data from our own galaxy, the Milky Way, and made the same observations," says Boyarsky. These results are the outcome of a study conducted by EPFL's Laboratory of Particle Physics and Cosmology (LPPC), in collaboration with the Institute of Physics at Leiden University in the Netherlands.